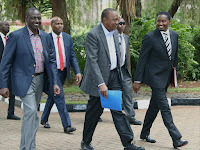 Monday April 15, 2019-Agriculture CS Mwangi Kiunjuri has once again defied President Uhuru Kenyatta’s order for all CSs not to engage in the 2022 politics. This is after he joined Deputy President William Ruto’s campaign trail yesterday urging Mt. Kenya not to abandon him come 2022. “Good is paid by good. There is no way a friend will rescue you from a leopard and then let that friend be eaten by the same leopard,” Kiunjuri stated. This open defiance by Kiunjuri may see him sacked by Uhuru any time from now.